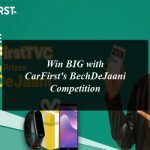 CarFirst, has raised one of Pakistan’s biggest round of series ‘A’ funding to reinvent the used car sales sector. Launched in late 2016, CarFirst aims to provide car sellers a safe and hassle free process to get their cars inspected and sold at fair price within an hour in which CarFirst even processes the payment. CarFirst uses an internally developed algorithm, market intelligence, and a professionally trained team to conduct inspections and valuations. Car First’sonline platform allows car owners to enter their car’s information for a free valuation, they can book an appointment at one of CarFirst inspection center for a physical inspection of their car. After the multipoint physical evaluation, which includes engine, brakes, tires and road testing, CarFirst’s team of market and technical experts guide the potential seller on the current market value of their car and make an offer to buy accordingly. CarFirst also provides a first of its kind online auction platform for used-cars in Pakistan. CarFirst’s App, provides their private network of buyers the fastest way to find the perfect car that fits their buyers’ needs. Providing fully inspected and certified cars which saves their partners the inconvenience of having to worry about any mechanical problems and feel rest-assured and secure about pre-checked paperwork. They ensure providing the safest marketplace for their partners with an extensive variety of pre-inspected used-cars from across the country. “Our vision is to reinvent how the used car are traded in Pakistan through technology and infrastructure creation. We developed this unique model where we make this a one window solutions offering competitive prices and a very secure experience to sellers. CarFirst is making it easier to sell cars by bringing in international best practices to Pakistan. The fresh funds, raised from Frontier Car Group, which builds and runs marketplaces focused on emerging markets in the auto sector, will be used to improve CarFirst’s online buying and selling platform, which is in turn backed by Balderton Capital and New Enterprise Associates, Inc. (NEA), EchoVC, and TPG Growth. CarFirst is held by the Frontier Car Group (Delaware LLC) with 90+ employees and currently operates in Karachi, Lahore and Islamabad.